I am married to a dairy farmer. So I may be more intimately familiar with the needs of cows than your average architect. But I’m not alone in my admiration of agricultural structures. Like many, I draw inspiration from the form, scale, rhythm and rootedness of farm architecture. Why is that? And, what might we learn about architecture from studying the farm? Architect-designed “solar fins” on a freestall barn block the low-angled western sun while allowing northwest breezes through, keeping cows comfortable. Let’s start with the obvious: Farms are located in beautiful places. The agricultural landscape is an ordered tapestry in whose contours you can read the accumulated, patient efforts and investments of past generations. In its fabric you can detect the patterned logic of efficient planting, the incremental ingenuity of those attuned to local conditions soils, weather and runoff patterns. This is a working landscape that changes not just with the seasons but by the week. Within this spectacular setting, the buildings are positioned and oriented, scaled and contained. Each structure on a farm belongs to that place. It gives measure to the fields. In both a practical and a symbolic sense, the structures are in balance with the fields that nourish them. As a result, these buildings simply “fit” the place. A house can be pretty, but a barn is sublime. The height and breadth and length of a modern free stall barn can feel like a cathedral from the inside – seemingly endless rows of trusses, each composed of the smallest lumber units available, but collectively enclosing a thousand linear feet in a rhythmic march to a distant vanishing point. As you walk down the central aisle, daylight filters in via a tall ridge vent while the black and white inhabitants ruminate and watch you silently. It is a serene and unintentionally spiritual moment (though you may not want to kneel). From a distance these long, low, repetitive structures are very comfortable in the broad, horizontal, rhythmically planted fields they inhabit. Things are not covered up on a farm. The gleaming corrugated metal grain silos are not painted; each rib creates a shadow line below, and glints in the morning sun. Some upper wall panels are translucent polycarbonate to let in more light; at night they slice through the darkness, emanating long ribbons of warm yellow light, like beacons for passersby. The skeleton of the barns are exposed, sometimes with a skin of operable canvas curtains that frames the landscape. Corn cribs of wood or wire express their porous purpose of drying their contents. Bunk silos of gray concrete contain vast volumes of hayleage and corn, their mute walls telegraphing only the pattern of the steel or wood forms that were used to make them. The inherent honesty in expressing materials and the effect of revealing rather than concealing structural members makes a farm a great laboratory for an architect! It almost goes without saying: Agricultural buildings are astylistic, unpretentious structures whose owners value incremental innovation over adornment. They need to perform their intended function perfectly and at the least possible cost. It is this ethic of Economy which is embodied in the “architecture” of the farm. But there is also an ethic of quality. Farms are capital-intensive, multi-generational endeavors; farmers (and their bankers) do not take their investments lightly. So things tend to be built to endure, with an eye to the future. This broader application of Economy is in the DNA of farm structures past and present. To me, there is much to learn about the beauty inherent in that spirit as well as in the forms that result from it. With all this background, you can imagine how thrilled I was to have our first agricultural commission. Farmers don’t usually consult architects, but my wife didn’t have a choice. The problem was that some of the cows on the west side of the freestall barn were baking in the afternoon sun. The conundrum here was how to omit hostile, low-angled western rays while admitting important cooling breezes. With Economy, Scale, Rhythm, and Expression firmly in mind, we developed a proposal: Lightweight 8’ tall “banners” spaced out along the western side, precisely angled based on the afternoon sun’s position, and hung on removable frames. 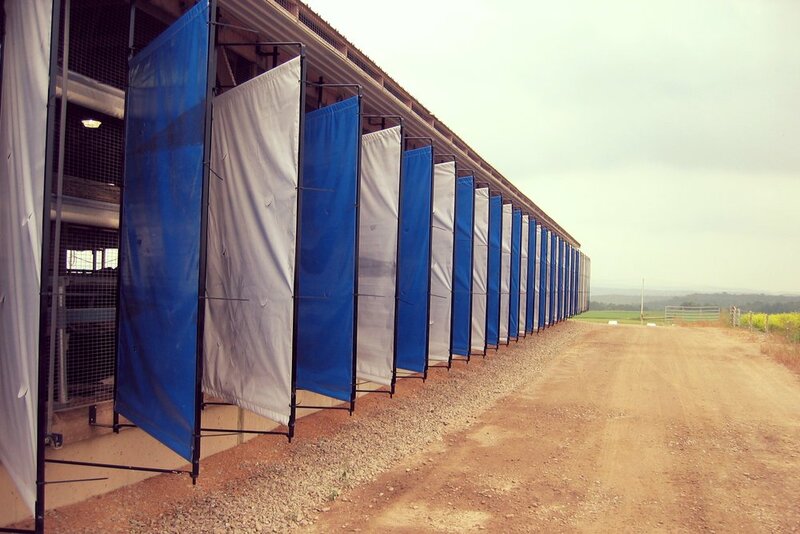 These “solar fins” can be detached when winds become hostile and the sun is welcome once more. The farmer seems to like this; as for the cows, they’re still chewing it over.